Every once in a while, I like to sit down with a spool of stringing wire and a drawer full of beads and just work on bead stringing projects. I love how quickly I can whip up a new batch of bracelets, necklaces and earrings, and there's something soothing about creating patterns or, on the flip side, allowing myself to just do some creative free-form stringing with no set pattern in mind. 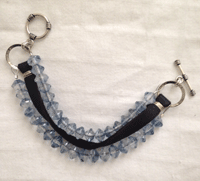 I love the blue and black color combination of this pretty beaded bracelet. 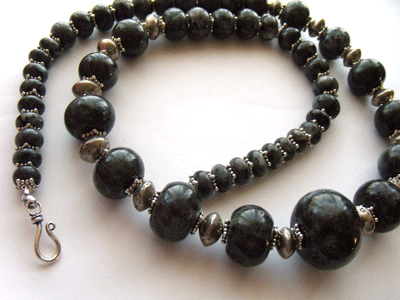 The glass beads mix perfectly with the black wire-wrapped ribbon, and the silver toggle is the perfect finishing touch. 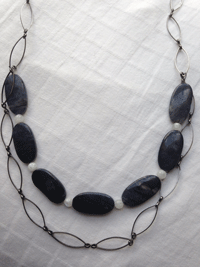 Simple, sleek, and elegant is how I would describe this combination of gemstones and chain. 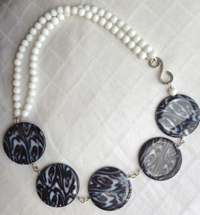 White onyx and patterned shell beads give this necklace a very cool, retro feel. Smoky quartz is a favorite gemstone of mine, and it looks beautiful when balanced with the blue gemstones and the funky silver finding on this asymmetrical necklace. It was the kind of road trip found only in your nightmares that involved miscommunication about class sign-ups (I was teaching two beading classes at the show), bringing the wrong displays for my finished jewelry, and getting horribly car sick after eating a very large vegan garlic pizza at the end of a hectic day and a 7-hour drive. But finally, on the last day of the show, things settled down, and I was able to spend the last few hours of the show shopping for some special treasures. I had seen these labradorite beads on my first day at the show, but didn't buy them right away. When they were still there during the final hours of that Sunday afternoon, I knew that they were meant to be mine, and I bought them and brought them home with me. I knew I wanted to string them with some beautiful silver accent beads, but I had a hard time figuring out what kind of beads would balance these bold gemstones. First of all, they're enormous — the center bead in the strand is 1 1/4 inches across at its widest point! Second of all, I didn't want to detract from the natural sparkle of these gems, so the accent beads would have to be subtle and unassuming. It finally hit me the other day, like a thunderbolt, when I re-discovered my labradorite beauties. I had recently acquired a small set of Ethiopian coin silver beads, part of my collection of antique trade beads from around the world. With some fancy Bali spacers to add a little bit of texture to the finished necklace, I had finally figured out the design! 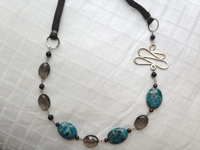 It was all falling into place: I had the accent beads, I had the Bali spacer beads, I even had plenty of heavy-duty bead stringing wire, and I had sterling silver crimps large enough to accommodate the crimps. What I didn't have was the right clasp to finish this piece. A tiny magnetic clasp wasn't going to cut it with this monster beads, and I wanted something with an ethnic feel to complete the look. Just when I thought I was going to have to bring the unfinished piece with me to Bead Fest Philadelphia this week to find the perfect clasp, my eyes fell on a bag of leftover components from some bead kits I had made years ago — and right on top, in a tiny plastic zip bag, was a simple Bali silver hook and eye clasp. If you're looking for year-round inspiration for your bead stringing projects, you'll want to subscribe to Jewelry Stringing magazine. 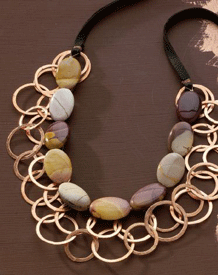 Let our expert editors help you keep up with styles and trends in jewelry-making, new beads, beading tools, books, techniques, and more! Subscribe to Jewelry Stringing magazine, learn new techniques and get fresh ideas for ways to tell your story by stringing beads. Do you have a special strand of beads with a less-than-average or interesting story behind them? Leave a comment here on the Beading Daily blog and share your stories with us!